Derrick Jones and Marcus Epps both scored their first goals for the Union and C.J. Sapong added another as Philadelphia Union defeated Harrisburg City Islanders 3-1 in U.S. Open Cup action. Jonathan Mendoza fired in the lone tally for visiting Harrisburg. Jim Curtin made a number of changes to his starting XI, notably giving Marcus Epps his first start for the club, Giliano Wijnaldum his second, and returning Derrick Jones to his post along side captain Haris Medunjanin. Jones would reward Curtin with his first goal in a Union jersey in the 18th minute. Jay Simpson received the ball on top of the Harrisburg box and looked to find a shooting angle, but was denied. The striker rolled a short pass back to Jones who calmly side footed a shot into the lower right corner of the goal from just over 20 yards out. Simpson himself had a great chance to double the lead in the 28th minute. Roland Alberg played in Simpson behind the Islanders backline and the striker only had goalkeeper Sean Lewis to beat, but Lewis made himself big and saved Simpson’s low shot with his foot. Simpson would earn himself a second assist on the night and in the half in the 32nd minute. After again looking for a way to shoot from near the top of the box after a swift counterattack from midfield, the striker found C.J. Sapong on the right side of the Harrisburg box. Sapong cut back inside and curled a shot with his left foot into the side netting past Lewis. Harrisburg would pull a goal back in the 37th minute. Jonathan Mendoza finished a fine pass from Paul Wilson at the back post, firing a high shot over John McCarthy and in off the crossbar. Harrisburg would have a decent chance to equalize in the 39th minute. Rasheed Olabiyi headed just over the crossbar from 12 yards from a corner kick as the Union again struggled to defend a set play. Philadelphia would regain their two goal cushion right after halftime. Marcus Epps was played in down the right side by Haris Medunjanin and was one on one with Sean Lewis after a Harrisburg defender fell down. Epps stayed cool in the ball and waited for an opening before dinking a shot past Lewis into the left corner of the goal. The goal was his first for the Union. The Islanders were resilient and came close to pulling a goal back in the 69th minute. First, John McCarthy did well to get down low to save from former Union man Pedro Ribeiro and then Shawn McLaws followed up and fired the rebound off the crossbar. Philadelphia returns to league play on Sunday, when they host the New York Red Bulls (5 p.m., ESPN). First goals. Derrick Jones and Marcus Epps both kept their cool when chances came their way and notched their first goals in a Union shirt. Haris-burg. Wearing the armband, Medunjanin was a class above everyone on the field and hardly played a ball wrong all night, notching an assist on Epps goal. Professional Performance. The Union will be disappointed to have conceded (and conceded a few additional chances) but it’s job done and on to the next round with no drama. Not their all time best game, but the Union were clearly the stronger side. Good to see some of the young players get a chance. From here on in, though, it is likely to be MLS opponents since their opponents for the next 3 regular season games all advanced and they’ll probably draw one of them next. Could easily be back to back games against DC or New England (or 2 NYRB games on either side of the DC game). This has been bugging me for awhile and I finally feel compelled to post this. 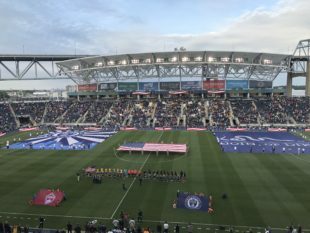 Union players – when you get subbed out of the match, there are many fans standing and clapping in appreciation for your efforts. Take a moment and acknowledge them by looking up and applauding back. It’s a habit that the club has gotten away from over the last few years and I think it’s about time that you bring it back. It’s a simple act and a smart thing to do. I sit 3 rows behind the Union bench and Ray is the only one this year I recall acknowledging the fan’s appreciation. It’s nice to not have your best and still win comfortably. Let’s keep the “comfortably” part going. Hey at least we weren’t Columbus losing to FC Cincinnati. Epps looked really good. Against lower competition for sure but that dude can dribble and he wants to take everyone on. Good stuff. D Jones is also a stud too. Both guys stood out for me. Simpson on the other hand… is absolutly brutal. All in all it was an acceptable performance. Nice night to have been down there too. Glad the heat was gone. On to Sunday!! Absolutely brutal or not, Simpson did manage assists on the first two goals when he found players who were in better position to score than he was. Sapong had to do a little work of his own on his goal but Simpson’s pass back to Jones was well played. I agree. I can’t imagine watching this game and thinking Simpon is brutal .. he had nice touches and looks comfortable in tight spaces. He had one or two really impressive touches to break free as well. No idea how this opinion is alive. Really? Simpson missed several chances: he was slow on a cross that coulda been his. He put a few balls over the bar that could’ve at least been on target – not saying he has to score a trick but I didn’t find he really made an impact at all. The assist to Sapong was just a pass where CJ did all the work. Give the Harrisburg keeper some credit, In re Simpson. I didn’t think Simpson was bad at all. He got stopped by the keeper again, which is frustrating, but he drew defenderS everywhere he went and his passing in the final third was really good. I agree. I though Simpson had a lot more positives than negatives. His first shot opportunity was pretty miserable, but he looked good after that. Logged two assists as well. Can’t say he had a bad game when he was involved in 2 of 3 goals scored. WHAT is going on with Keegan Rosenberry this year? His head is somewhere entirely different than last year. Out of position more than a couple of times, and arguing with the ref constantly throughout the match. Shut up and get your head in the game. Alberg looked like he had zero desire to be in there tonight. I saw little effort on his part to make anything happen away from the ball. Actually, I saw very little effort at all unless a ball happened his way. I cannot stand to see John McCarthy in the Union goal. I can’t even decribe how bad that back pass botch was. Zero excuse. It says everything about his ability to perform competently. Nice kid? You betcha, he’s terrific. So give him a desk in PR, he does not belong on a professional field. Completely agree on Rosenberry and Alberg in this game. Keenan was complaining constantly, and then distracted and not involved on the restart more than once. Alberg looked slow and generally disinterested. I’m OK with McCarthy, he’s not the show that Blake provides but his distribution and communication were fine. Actually, I thought McCarthy came up with several nice saves tonight. Union could easily have been in a tougher match without his intercession. I would lay about 80% of the back pass botch on whoever made the pass (Elliot?). I did not think it was a well played ball. My thinking is this is the first adversity Keegan’s ever faced in his career and isn’t responding super well to it at the moment. Note to Keegan: When encountering semipro ref, put your hands behind your back, your head down and shut up. That ref was looking for trouble and you almost got it. This does not excuse the ref for losing his cool, but he was actually serviceable compared with some of the antics we’ve seen from PRO refs. Pretty sure he was a PRO ref. He’s called MLS Union matches…. I don’t think Keegan was THAT bad, but I do agree that his passing continues to look off, and it’s definitely a contrast from last year. He was also one of the people at fault for the goal, but he shares the fault at least with Elliott (who got beat on the cross) and Wijnaldum (who got caught WAY too far up field). I don’t disagree he is off, but good god with him in there the RB ACTUALLY is part of the offense. Yes he isn’t blowing the doors off anymore but at least he is capable of taking a touch, looking up, and finding a pass. My issue with Keegan this year is he kills the ball’s momentum, always standing on it and waiting for the defense to react. Then, more often than not, he hoofs the ball upfield instead of finding Jones, Bedoya, or Medunjanin. He’s got too much passing skill to always be trying to hook the ball onto a runner. I won’t comment much on Alberg, because I always harsh on Alberg. But at least he made one really nice defensive play in like the 88th minute! I was impressed that he was a) thinking about defense; and b) fit enough to actually do that in the 88th minute. And that’s about all I’ll say. Which was interesting, because just before that play he looked like he was going to hurl right on the field. Even the ref went by him and asked if he was okay. That Jim Curtin went as far away from his regulars as he did is worthy of some contemplative thought. Harrisburg started in low pressure mode in the midfield, and the Union shredded them. I assume Becher did that because he does not have the conditioning to hig press an MLS side for 90. That being said, when they went high press, they were more effective. That Union back line has sufficient ball skill to distribute other than directly. Yaro and Elliot compensated well for Derrick Jones’s reluctance to try offensively oriented forward passes. In that game Jones was very effective offensively on the dribble. Aaron Wheeler not being available to Harrisburg removed a significant threat to the defense. Aaron is a threat to which defense, exactly? I forgot how well Josh Yaro could pass the ball. He sliced through lines with some of his passes (with the ball on the ground!) like he used to do last year… that was a pleasure to watch. He is exceptional. I love the idea of Yaro and Elliot anchoring the interior defense. Huge range. Both feet. Plays early unlike some of his teammates. Passes to receivers direction of play…. whole bunch of little things he does very well. Hope Hope Hope he remains match fit. So far this year the best thing to happen to this team is Marquez being a back up…. Elliot a revelation thus far. Closes down very well. Breaks pressure with one touch often. Tall. Quick enough. Good feet. Pretty clearly of high pedigree. I agree with the chorus above that Simpson looked pretty good. At his price he shouldn’t be back next year but perhaps he finds his form a gets some more goals like he did vs Toronto. I would trade Alberg for Harrisburg’s #10 (on his jersey… the shorter waterbug running around out there). Would have liked to see Najem. That said, I was very happy with the different players at other slots so I’m not complaining. Was Rosenberry trying to show Curtin that he is tough or that he cares? Just speculating.